Pointed tropical plants make wonderful focal pieces for any room décor. In their natural surroundings, the pointed leaves are shaped to draw water in, as with bromeliads, or to provide light shade for their tropical companions, as do palms. In the home, the pointed foliage will draw attention, add interest to a room, and create an attractive and exotic atmosphere. Palms have pointed fronds that originate from a single growing point; a woody trunk or cane-like stem. Divided on either side of the mid-rib into long, pointed leaflets, that can be soft and droopy or stiff and erect. Leaflets may be wide or narrow, and range from a light, yellow-green to dark green depending on the variety, but all lend a tropical feel to a room. They require average warmth, partial shade, and good drainage. Palms like slightly moist, but not soggy compost or soil, should be misted frequently and fronds should be sponged off occasionally. The graceful, finger-like, serrated leaflets of the False Aralia are a deep, dark green in color that can be almost black, giving it a delicate, lacey appearance. False Aralia can grow up to six feet in height and they like moist soil and moist air. Dieffenbachia can grow up to five feet in height, with large, wide, pointed leaves that are very attractive, varying in color from white, to a variety of green and white combinations, to a all green. They are slightly difficult to grow, and require very specific growing conditions that include average temperatures; bright winter lighting and partial summer shade; regular watering from spring to autumn, tapering off in the winter months; frequent misting and damp peat moss surrounding the surface of the pot to increase humidity, washing leaves occasionally. Temperature fluctuations and cold droughts can be deadly to some varieties. To add an eye-catcher to any room, the bright colors of the many varieties of Bromeliad are sure to attract attention. Native to the American jungles, Bromeliads come in many different varieties, with numerous variations in both flowers and foliage. The pointed, leathery leaves come in colors, from dark green, to red, to purple, with flaming shades of the various pointy-headed flowers in pink, red, yellow and orange. Bromeliads need high temperatures, above 75 degrees Fahrenheit; a brightly lit location, away from direct sunlight; good drainage; and frequent misting, substituting liquid fertilizer for water occasionally for natural absorption of nutrition. 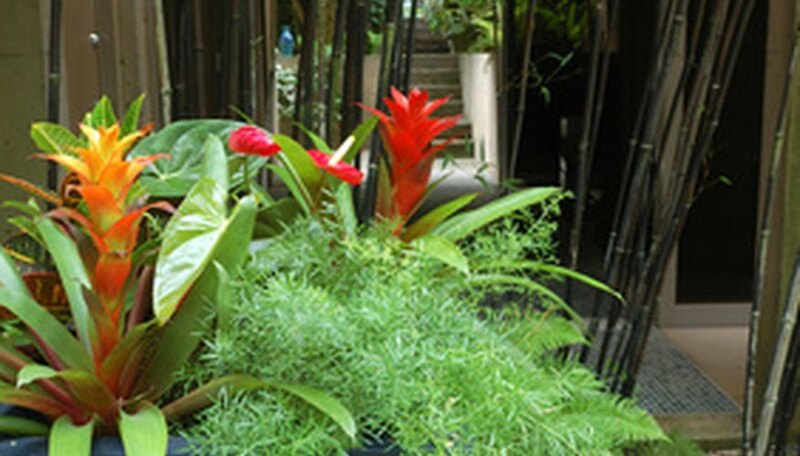 Water bromeliads in the central cup formed by the foliage, watering compost or soil only when it dries out. Mature Pineapple plants produce pink spiky flower heads, and small, fragrant, inedible fruits under warm, humid conditions. Like the flower heads, the variegated foliage is spiky and saw-edged, in green, white, cream and pink. Hessayon, Dr. D.G. “The Houseplant Expert”. Expert Books: 1993.